Zoning OfficerAs a civil engineer with over 35 years of experience, Roy Rieder has experience in design, construction quality assurance, and regulatory compliance. After graduating from the University of Pittsburgh, he served in the armed forces as an engineer commissioned officer in several Engineer units, both overseas and within the continental United States. After his military service, he held various positions in the northeast as a design engineer and project manager, eventually settling in southeastern Pennsylvania with his family.Roy has been working in Warrington Township for twelve years beginning as an assistant to the township engineer before joining the township staff as Zoning Officer in 2011. His responsibilities include conducting zoning reviews and answering questions related to zoning, coordinating applications with the Zoning Hearing Board, and coordinating and tracking land development applications and subdivisions. He serves as staff liaison to the Warrington Township Planning Commission, Zoning Hearing Board, Open Space and Land Preservation Task Force, and the Bike and Hike Committee. He also lends support to the Department of Public Works and provides engineering support on an as needed basis. Q. If a new business or development project is planned near my home, what is the process for receiving information and can I contact you for updates? A. We encourage interested folks to monitor our website for specific matters coming before the Planning Commission and the Board of Supervisors. 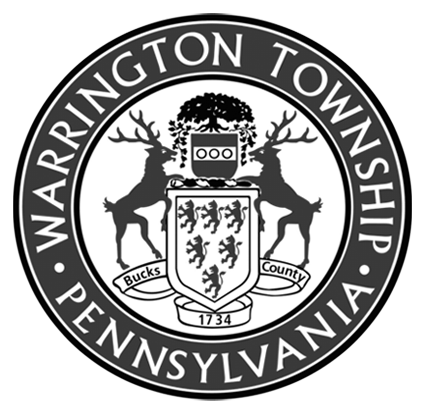 The agendas for the Board of Supervisors and for the Warrington Township Planning Commission are normally posted on the township website by close of business on the Friday preceding a meeting. Interested persons can always contact the township for information prior to any public meeting. Under a state law known as the Municipalities Planning Code, an owner of a tract or parcel of land located within Warrington Township or an owner of the mineral rights in a tract or parcel of land within the township may request that the township provide written or electronic notice of a public hearing which may affect such tract or parcel of land. Electronic notice shall be required only if an owner within the township has made a written request that notice be sent electronically and has supplied the municipality with an electronic address prior to a public hearing. An owner within the township making the request and supplying an electronic address may at any time notify the municipality that the owner of the tract or parcel of land located within the municipality or the owner of the mineral rights in the tract or parcel of land within the municipality no longer will accept electronic notice, and, in that event, the municipality may no longer provide electronic notice. The owner within the township who has requested electronic notice shall be solely responsible for the accuracy and functioning of the electronic address provided to the municipality. The municipality shall not be responsible or liable if the owner does not provide to the municipality notice of any changes to the owner’s electronic address. Mailed notice shall be required only if an owner within the township has made a written request that the notice be mailed and has supplied the municipality with a stamped, self-addressed envelope prior to a public hearing. An owner within the township who has requested mailed notices shall be solely responsible for the number, accuracy and sufficiency of the envelopes supplied. The municipality shall not be responsible or liable if the owner does not provide to the municipality notice of any changes in the owner’s mailing address.